We've taken the leg work out of searching for children's toy diggers from you, by doing it ourselves. 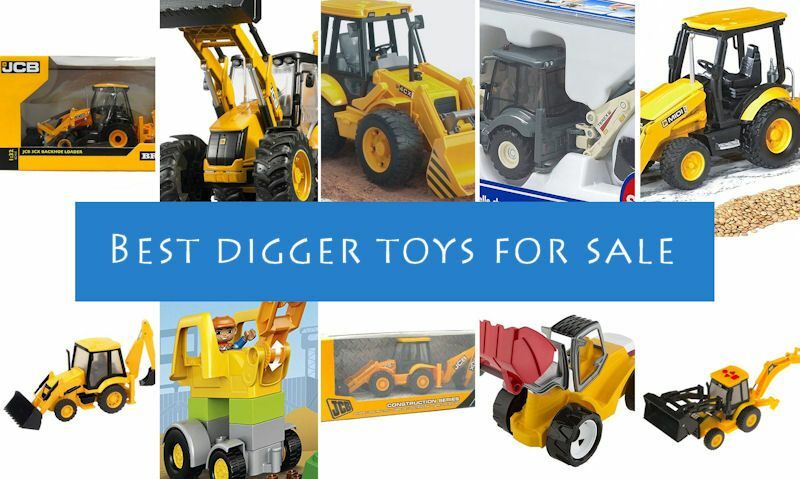 And believe us when we say it's been hard work seeking out available toy diggers for sale in the UK, in the shops or online. 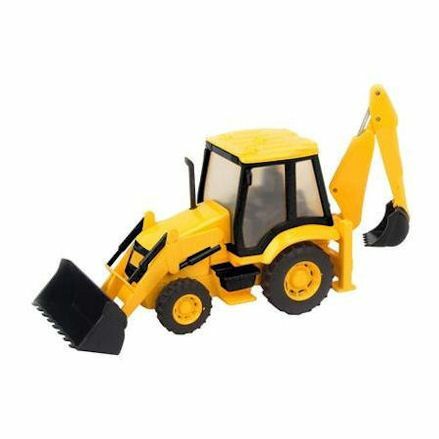 What we hope to accomplish with our top ten list is showcase what we consider good old fashion toy diggers we associated as a kid. 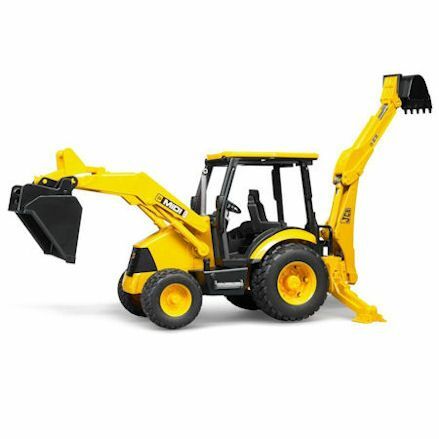 They should in theory include a big scoop on the front and an excavator on the back - but as we're in the UK, understandably our list is dominated by yellow JCB. 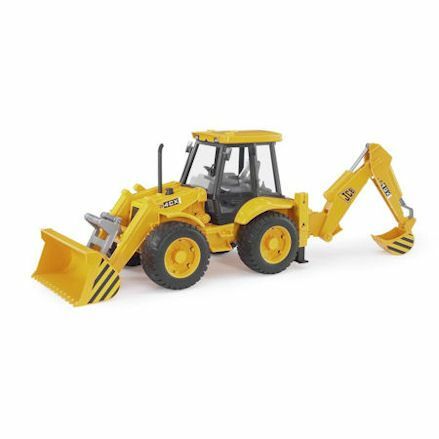 You may also want to visit our construction toy page for related construction vehicles and accessories. 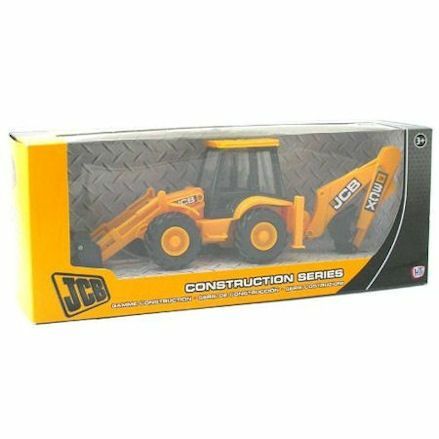 First and foremost, our top choice must be a digger in 1:32 scale, and here it is in the form of Britain's JCB backhoe loader. But why is this our top choice? Largely because this is children's favourite scale in farming toys, and if bought will pair up with dozens, possibly hundreds of toys in the same scale. 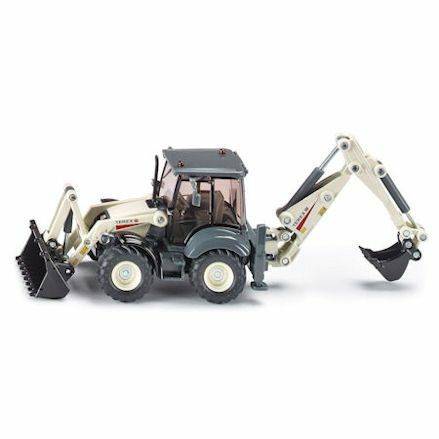 Again, with the reasons given above, our second choice must be the latest addition to the Bruder series, the JCB 5CX Backhoe loader in a big 1:16 scale. Released in 2015, this stunning yellow digger has functioning front loader with bucket, working rear bucket, stabilizers, opening doors and can be steered using a rod through the roof. Still going strong after a 14 year release, this Bruder backhoe comes in 1:16 scale with a real working front loader and rear backhoe for digging in the sand or mud outside. Be sure to use the steering rod that comes with all Bruder models to steer the wheels using the access hole through the roof of the driver's cabin. Well a smaller model than 1:32 scale, this 1:50 still might fit in on the building site without standing out to much. 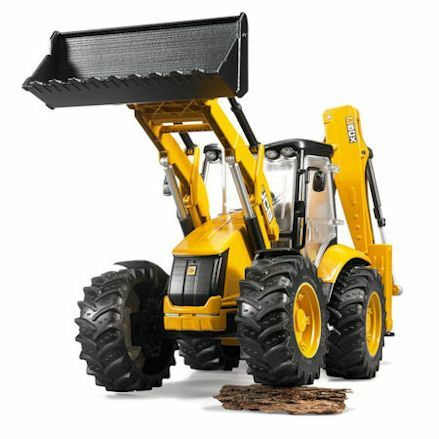 Made from die-cast metal, it has free rolling wheels, functioning rear bucket and front loader with tipping action - plus visible working hydraulics and detailed stabilizers and enclosed cabin for show. For the third time on our list, we can't help but include Bruders final backhoe in the series, the JCB Midi CX Backhoe. This one was released in between the two we've mentioned above, and has all the features we've explained above. But with this one it's a little smaller so ideal for building sites (gardens or houses) where lacks of space is a problem. 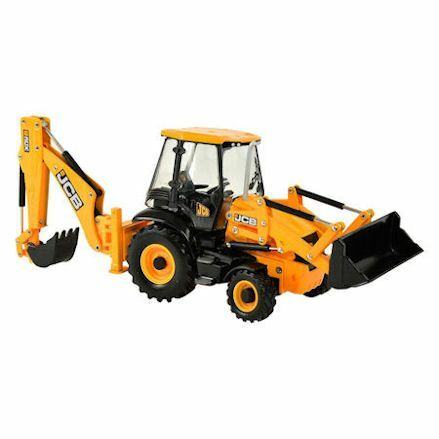 You can always rely on HTi to introduce a vehicle that is sure to pop up on these lists, and as usual they've done it with this JCB 3XC Backhoe. And well it lacks quality like the well known brands above, this is a fantastic alternative when budget is a concern. But despite this it does still have quality with all the working features and details you would expect. Again, Lego also come up on lists and they've produced a fine looking backhoe here, in their trademark Duplo Town with a smooth, chunky look and feel. Instead of digging up mud and gravel here, you're likely to be picking up Lego bricks. 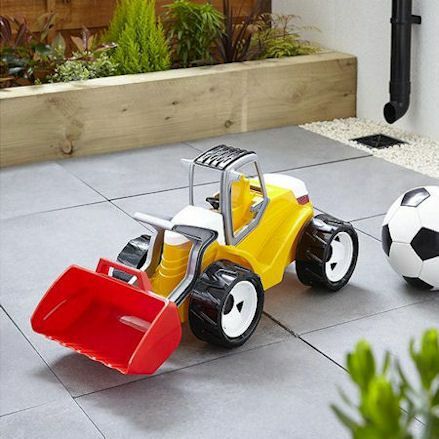 This construction set has working parts that will keep the young builder entertained. 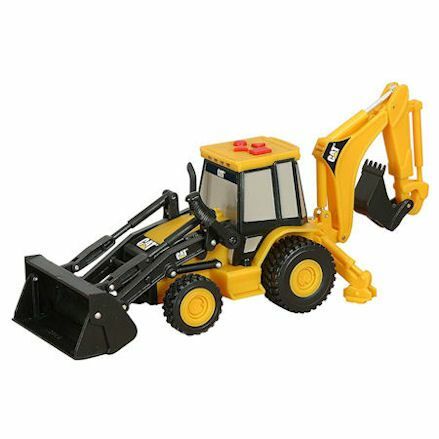 Teamster release toy vehicles for all needs, including this yellow toy digger with front loader and rear bucket, with glazed cabin windows, steps and stabilizer detail. 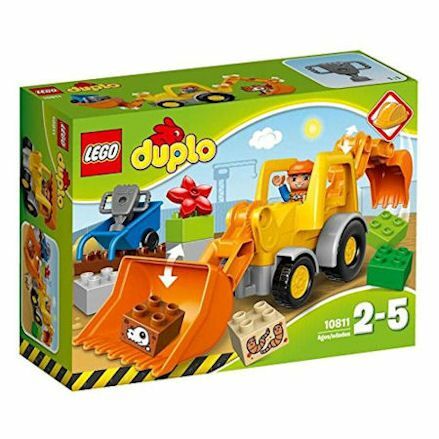 Well not a model boosting any impressive functions or features, this is a nice and cheap digger to help you start them off with building site play. As an unknown brand, this should tell you how difficult our list was to fill. But is looks to be licensed by CAT so you should be in good hands. If we had to take a guess we'd say this one was manufactured by HTI, as they are known to build models like this one. But unlike the diggers above, this one has lights and sounds using the buttons on the roof. We've looked far and wide to add the final toy digger to our list, and this is what we found over at Tesco - a big Lena Giant Truxx Digger for indoor and outdoor play. A big scoop on the front is controlled using a handle for lifting, with an extra handle located on the bucket to tip out the sand, gravel or mud.